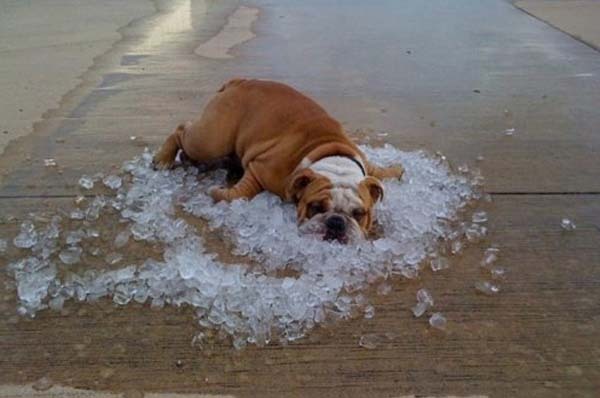 The days of hurrying to get back into an air- conditioned space on hot summer days may be about to come to an end. Imagine wearing clothing which act like an air conditioner and cools you down – even on the hottest days. Well you don’t need to imagine this. It has actually happened. A clever Japanese engineer Hiroshi Ichigaya has developed a cool new invention for hot summer days. A jacket with its own air conditioning unit is not just on the drawing board. People are already wearing these jackets. So now, instead of trying to find ways to escape the stifling heat and the wilted clothes, wilted hair look, all you need to do is put on your jacket before leaving the cool conditioned interior of your work place or your home or wherever else you may be. Developed by Meadowlics, the Kuchofuku jacket uses two small fans fixed to the right and left sides of the jacket around the waist, which draws air into the garment and causes sweat to vaporize, the heat is dispersed and body temperature is brought down. 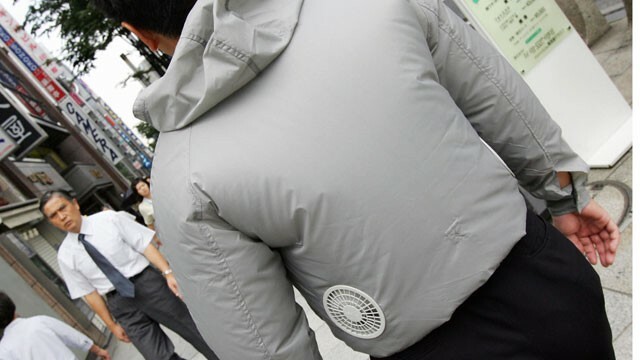 Ichigaya says the constant breeze running inside the jacket helps evaporate all the sweat and creates a personal cooling system in the process. He explains that the goal is not to lower temperatures outside the body but expand the body’s comfort zone, and eliminate the need for energy-consuming air -conditioners. Inventor of the air- conditioned clothing range, has managed to turn his invention into a business success – due in large part to the sweltering Japanese temperatures and severe power shortages stemming from the triple disasters stemming from the earthquake and tsunami that hit Japan this year. The founder of Kuchofuku, or “air-conditioned clothing”, former Sony engineer, Hiroshi Ichigaya, says sales for his clothes have increased 10-fold. Phones at his office haven’t stopped ringing. The first standard air -conditioned jacket marketed by Ichigaya sold for roughly $140 online. However his collection has expanded. The Kuchofuku catalogue now advertises a variety of different jacket styles, shirts for men and woman, a hooded jacket, and cargo pants – all air-conditioned. Ichigaya points out that air- conditioning an entire buildings seriously adds to the problem of global warming. His invention helps with this problem. There is no need to cool the entire room he says. Just put on air -conditioned clothing. Kuchofuku clothing first hit the market in 2004, after a particularly hot summer inspired Ichigaya to come up with more energy-efficient alternatives to traditional air conditioners. Wearing the lithium-ion battery-powered jacket enables the wearer to bask in cool air for up to eleven hours on a singe charge thus consuming significantly less power than what would be used by a traditional air -conditioning unit. Kuchofuku air -conditioned clothing now sells to over 1000 companies in Japan. And a post in the high profile Huffington Post blog in July this year suggested that Americans would do well to look at buying the cool clothing to get through the sweltering hot US temperatures that have been a feature of American summers over the past few years. the Huffington Post blog suggests that the small Japanese Kuchofuku company may the answer to keep you cool. The range of air- conditioned clothing on the market is hardly the most desirable piece of apparel design to grab for this summer’s wardrobe, as the photo below shows. However given the fast approaching Australian summer (and they seem to be getting hotter each year), perhaps the air -conditioned jacket will become a must-have wardrobe item. Something for up and coming fashion designers to consider? Not a bad idea. There seems to be a market out there. Why not make the air conditioned clothing design attractive!